The global industrial gas market is benefiting from rising consumer demand for freshness in food products, according to a recent market research report. Health-conscious consumers are demanding fewer additives and safer and fresher food products, which increases the demand for industrial gases that can be used in place of chemical ingredients. As a result, the food and beverage industry is buying increasing quantities of food-grade industrial gas that are used to chill, freeze, and package a variety of food products such as dairy and frozen products, beverages, fruits, vegetables, meat, fish, seafood, convenience foods, bakery, and confectionery. Food-grade gases are high-purity gases that comply with food grade standards; they include nitrogen, oxygen, and carbon dioxide. Another industry where demand for high-grade industrial gases is expanding is healthcare. In addition to oxygen, which is used in medical facilities to aid in the treatment of hypoxemia and hypoxia, carbon dioxide is used for insufflation and is often combined with oxygen or air as a respiratory stimulant to promote deep breathing. Nitrous oxide, nitric oxide, and other industrial gases like hydrogen, helium, and xenon are also being prepared for clinical use in pharmaceutical products. Treatments and drug developments using induced pluripotent stem cells (IPSs) will bring new added value to the industry through the application of systems using gases such as carbon dioxide and liquid nitrogen, which are indispensable for the cultivation and preservation of cells and tissues and is driving demand for high-grade industrial gases. One influence on the market is the use by industrial gas companies of pressure swing adsorption (PSA) technology as a cost-effective and highly efficient method to produce industrial gas. PSA systems operate on the process of static separation of ambient air (comprising oxygen, nitrogen, and other gases) using an adsorbent capable of extracting the target gas at high pressure. For instance, mobile PSA systems are being increasingly adopted in the healthcare and hospital sectors and are slowly replacing high-pressure cylinders. Oxygen for the healthcare sector is now being produced onsite with the help of mobile PSA systems, thereby replacing the need for the delivery and storage of oxygen, thus reducing costs. These PSA systems are portable, easy to transport, and eliminate the risk associated with high-pressure cylinders. They are therefore being increasingly installed in military hospitals and ambulances. In 2015, the first PSA oxygen unit in an ambulance in China was installed. By replacing the use of oxygen cylinders in ambulances, the risk of oxygen deficiency leading to loss of life because long-distance travel or traffic is reduced. As a result of these and other trends affecting the manufacturing, metallurgy, chemicals, and healthcare industries, the global demand for industrial gases has accelerated from its recent growth rate of 2.7% a year to 4.4%, a rate which is predicted to make its global market worth $87.46 billion by 2021. 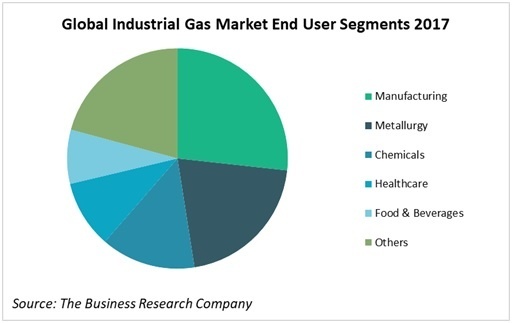 By end user industry, manufacturing is the largest global segment of the industrial gas market mainly due to manufacturing demand for industrial gases such as nitrogen and hydrogen. For instance, in the automotive industry, nitrogen in combination with other welding gases is used to weld auto parts, frames, mufflers, and other components. Nitrogen is also used in high Reynolds-number wind tunnels, heat treating furnaces and autoclaves, and to help create strong and lightweight materials. Hydrogen is used in the manufacture of heat treating furnaces and parts. Metallurgy was the second-largest end-user segment, mainly due to the use of oxygen to increase combustion efficiency in both ferrous and non-ferrous metal production. CO2 is used as a shielding gas that prevents atmospheric contamination of molten metal in electric arc welding processes. By type of gas, nitrogen is the largest segment of the global industrial gas market, followed by oxygen, hydrogen, and carbon dioxide in that order. However, this varies considerably by region and country. For instance, whereas nitrogen followed by oxygen are the largest segments in Asia Pacific, that order is reversed for Western Europe. Similarly, whereas China's market for nitrogen is its largest segment, in Japan, oxygen is the largest segment and accounts for a higher proportion of the total than nitrogen does in China. These variations follow from the differing importance of the end user industries in different regions and countries. Segmental growth rates also vary considerably by region and country. For instance, while growth rates in all segments by type of gas is much faster in India than the global market, its strongest growth in the country is in the category that includes gases such as helium, argon, and neon. Growing demand from the automotive, food and beverages, and metallurgical industries of India is driving sales in this category upwards at over 12.6% a year. In contrast, sales of oxygen are the fastest-growing in China, mainly due to demand from the pharmaceutical manufacturing industry, as increased public and private healthcare expenditure drove market growth. China is the second largest pharmaceutical market in the world. 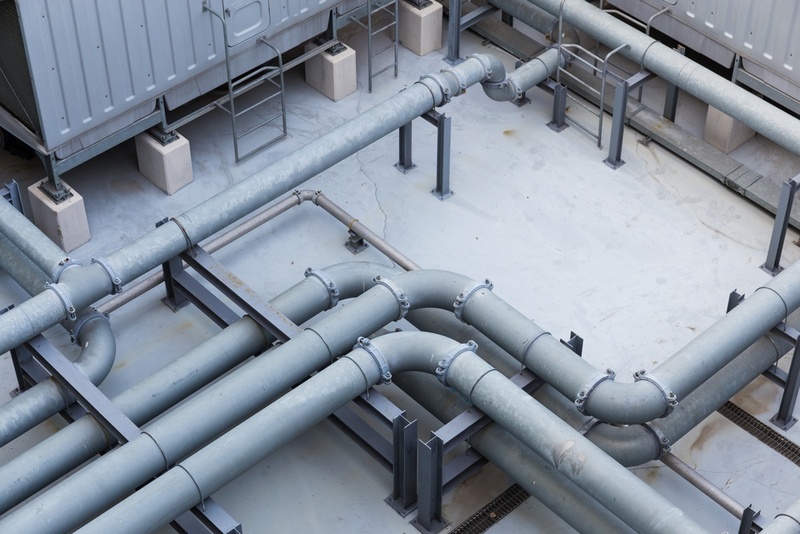 Many national and state governments have stringent laws associated with industrial gas manufacturing, storage, and distribution to prevent accidents and contamination. For instance, the Current Good Manufacturing Practices (CGMPs) are regulations enforced by the US Food and Drug Administration to monitor the quality of medical gases. The CGMPs regulate proper monitoring and control of manufacturing processes and facilities in the medical gases industry. Some of these regulations increase operational costs, thereby affecting the profit margins of industrial gas manufacturers. The European Union safety regulation REACH (registration, evaluation, authorization, and restriction of chemicals) stipulates that all chemical substances must be registered. CLP (classification, labelling and packaging of substances and mixtures) is another European Union safety regulation that focuses on the safety of consumers and workers. Complying with these regulations tend to increase the operational costs of industrial gas companies, thereby affecting their profit margins. 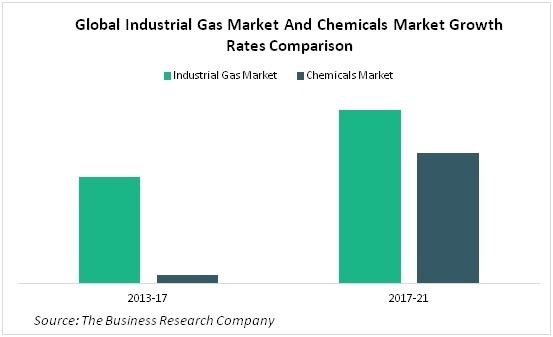 Markets Covered: Industrial gas market, nitrogen, hydrogen, oxygen, carbon dioxide, other industrial gas, chemicals market. Industrial Gas Companies Covered: L'Air Liquide S.A, The Linde Group, Praxair Inc., Air Products and Chemicals Inc., Taiyo Nippon Sanso Corporation. Data: Industrial gas market size and growth for 7 regions and 12 countries; global regional and country industrial gases market size and growth segmented by type of gas — nitrogen, hydrogen, oxygen, carbon dioxide, other industrial gas; global, regional and country industrial gases market size and growth segmented by end user industry — manufacturing, metallurgy, chemicals, healthcare, food and beverages, other end users; global, regional and country industrial gases per capita consumption and market size as a percentage of GDP 2013-21; L'Air Liquide S.A, The Linde Group, Praxair Inc., Air Products and Chemicals Inc., Taiyo Nippon Sanso Corporation financial performance 2013-21; global chemicals market size and growth rate 2013-17 and 2017-21. Other Information: PESTEL analysis, drivers and restraints, customer and operational insights, industrial market by country covering opportunities, industrial gas associations, investment and expansion plans, corporate tax structure and competitive landscape; industrial gas industry trends and strategies.